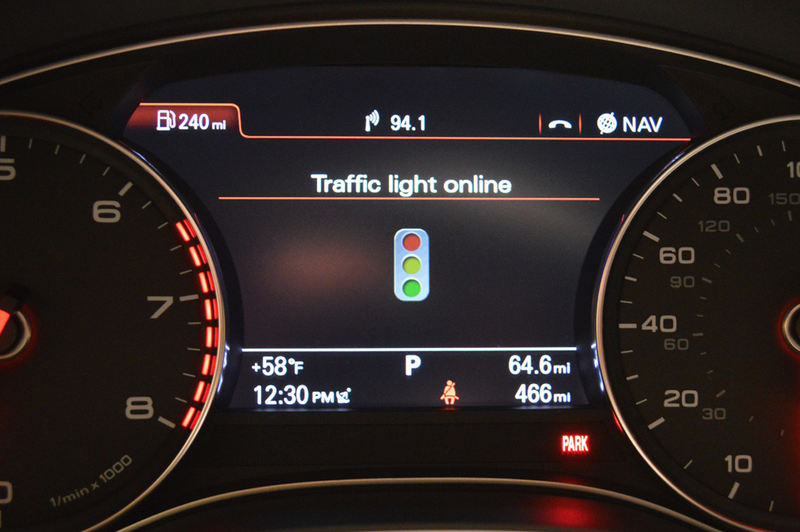 Audi will integrate a system called the Smart City Traffic Light Assistance into Audi Connect and its Multimedia interface which helps drivers get to know traffic lights better. The system is designed to help save fuel and time by alerting drivers on potential light changes right on their car's instrument display. The Smart City Traffic Light Assistance system was announced at CES 2014 earlier this year and was tested in Berlin, Las Vegas, and Verona at the time. The technology is ready for primetime and will soon be integrated into every new Audi model. Audi's system relies on local data sent to the car via wi-fi about traffic light patterns and timing. The car then shows the driver the speed to maintain in order to pass through traffic lights during their green phase with the help of red, amber or green icons. Follow the speed recommendation and you could never see a red light again. If, by chance, or your rebellious attitude, you do hit a red light, Audi connect calculates the time remaining for the light to change to green and shows you a countdown timer. If you turn off your car at the red light the system can automatically turn it back on about 5 seconds before the light changes so that you're ready to go at the right time. The fully functional system is now production ready and could be fitted to every Audi model in the range subject to the necessary government legislation. It was actively demonstrated recently on the busy Las Vegas freeways in an Audi A6 Saloon as part of a trailblazing technology display at the Consumer Electronics Show, and comprehensive testing continues in Las Vegas with 50 sets of traffic lights. Testing is also underway in the northern Italian city of Verona, where some 60 traffic lights covering almost the entire city centre are involved, and in Berlin, where 25 Audi customers are driving cars fitted with Online traffic information that can link up to a total of 1,000 traffic lights in the city. A market launch is currently the subject of intense analysis in the United States. Audi says this technology can help cut emissions by 15% and save about 900 million liters (238 million gallons) of fuel annually in a country like Germany alone. With numbers like those, it may only be a matter of time before we see this technology reach end users.